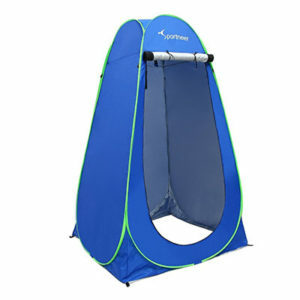 A pop up privacy tent is essential for keeping a bit of decency on the beach, camping or even in your own backyard. Known for their quick setup and versatile feature set, a privacy shelter offers a convenient solution for changing clothes, outdoor bathrooms and portable showers. No longer will you have to stand semi naked under a tree branch or rush off to a disgusting port-a-potty. Instead you can quickly pop open your own tent, step inside and nobody will be the wiser. In this article we’ve taken a look at some of the best pop up privacy tents on the market. We’ve ranked them based on their features, materials, sizes and built quality. After an extensive research process we’ve narrowed down the list to our top picks. You’ll also find a handy buyers guide that can help you select the right model based on your specific needs. However, if you just want to skip to our favorite choices, take a look a the Green Elephant Pop Up Utilitent and the Campula Portable Pop Up Tent below. Standing at an incredible 83 inches tall and having 15.3 square feet of floor space, the Green Elephant Pop Up Utilitent is the biggest, and by far the best privacy tent on the market. You’ll find it’s pack full of features such as a removable rain cover, towel hanger, storage pouch and more. Additionally it folds up into a convenient 24″ disk and weighs a negligible 5.5 pounds. This makes it a great portable option and with heavy duty zippers and double stitched seams, it’s definitely built to last. As our runner up, the Campla Portable Pop Up Dressing and Changing tent is absolutely stuffed full of features and offered at a great price. You’ll find that at 75 inches tall it has excellent head room. Plus, the sturdy steel frame is covered in water repellent taffeta 191-D Nylon fabric for true outdoor resistance. A breathable meshed roof vent is position overhead for enhanced air circulation and natural light. However, if a storm rolls in, the Campla comes with a removable rain fly for extra protection. When you add in the removable bottom mat and hanging storage bag, you can see why we’ve ranked this #2. A pop up privacy tent is an essential piece of gear for any camping, beach or backyard adventure. This is particularly true if you’re a bit shy of changing in front of others or perhaps want a bit of privacy when going to the bathroom. Whatever your reason, a good privacy shelter is a budget friendly, highly portable piece of kit that’ll give you all the seclusion you need. 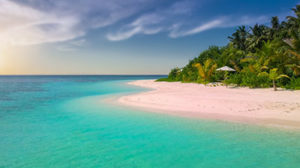 Going to the beach should be a fun family excursion that creates awesome memories. A pop up privacy tent will let you skip the lines in the bathrooms and change right on the sand. Even more, it’ll give you a convenient place to shelter from the sun and help to mark your location on the beach. Most of the privacy shelters we’ve reviewed also come with guy lines and stakes so you can anchor your privacy tent in windy conditions. A camping trip is a great way to start of the summer and can be an amazing experience if done right. While experienced outdoorsmen might not mind the open air and and rough terrain, city folk might want a bit of privacy in the woods. A pop up privacy tent provide a great place for a portable toilet or shower setup in the wild outdoors. Plus, it’ll give you a little peace of mind that no creepy crawlies will surprise you while your vulnerable. Simply put, you can find a ton of uses for a quick shelter like this, and it’ll make city dwellers have a much more enjoyable time. 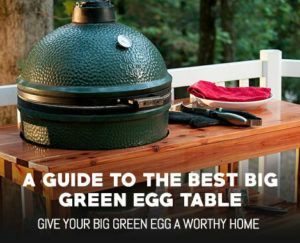 You can also use it as a quick way to cooking equipment like propane burners and outdoor wok burners. From swimming pools and portable hot tubs, to water balloon fights and more, a backyard is full of opportunities to utilize a pop up privacy tent. Wet kids won’t have to run inside to change after a pool party and adults can quickly slip into more comfortable clothing during a backyard BBQ. A good tent is perfect to stop people walking in and out of your house, especially if you’re picky about being clean. Additional, since you’re so close to home you can even use it as a makeshift fort for your kids to play in. If there is one area where a portable pop up privacy shelter really shines, it’s being used for outdoor event. Whether you’re setting up a tailgate for the big game or attending a concert on the open grass, there are hundreds of uses for a good shelter. You can easily set it up as a place to quickly change clothes or use it to get out of the rain. Plus, if you just need a place to house a luggable loo and don’t want to use the disgusting port-a-potties, your own shelter is a godsend. Overall, these types of shelters are great in nearly any situation and well worth their cost. While many pop up privacy shelters seem very similar, they all have a few features that set them apart. Some have double layered fabric for enhanced privacy while others boast increased ventilation or removable floors. Whatever you’re after, you’re bound to find the right model eventually. Our goal however is to make that process as easy as possible. We’ve broken down the selection process into four sections so you can understand the nuances of each. 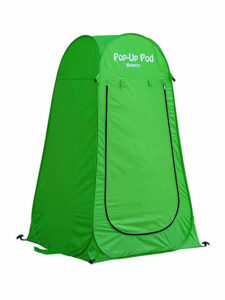 A pop up privacy tent needs to be easy to set up and quick to take down. After all, if you wanted to fiddle with poles and string you would’ve just gone with a regular tent right? A typical model will come folded up in a carrying bag. Setting them up is as simple as opening it up, pulling one side and stepping back. Where the privacy tents differ is in how hard they are to fold back up. The higher end models usually take only a few minutes to pull down and get back in their bag. Some of the cheaper options will never go back in and are prone to breaking if bent or stressed too much. We’ve tried to choose only pop up tents that are high quality and easy to store. Although, the number 9 and 10 spots are more budget picks and not quite as durable. When buying a pop up privacy tent, you’ll obviously want it to be portable, lightweight and ready for the road. As such it needs to have the right dimensions to easily be packed and moved. When buying, look for models that fold down to between 20″ and 24″ diameter circles. This is the sweet spot and is small enough to move with ease. Weight wise, you should be looking in the 4-6 pound range. In this region you’ll still have high quality and durable components but they won’t weigh a ton. If you go above it, your tent might be awesome, but nobody will want to carry or set it up. Also, stay away from privacy tents that when folded, are squares. They have a lot more failure points than a circular design and might leave you in a disappointing situation. Materials can vary between models but you’ll see a few recurring options. Frames come with either steel, aluminum or fiberglass poles. Steel is the most common and is typically strong, durable and cheap. However it is a bit on the heavy side. Aluminum is the least used of the three and while strong and lightweight, it is easily bent when folding up your tent. Fiberglass makes for a great choice if you can find it. Not only is it ultra lightweight, but it’s got enough flexibility to stand up to significant abuse. However, if you bend it to far it’ll simply snap instead of being bent. The other area in which you’ll get to choose materials is the fabric. Your options will be limited to nylon and polyester. 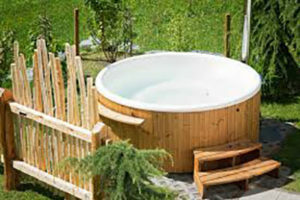 Each are great for the outdoors as they are both highly water, mold and mildew resistant. There really isn’t any reason to choose one over the other, but nylon does tend to be a bit flashy while polyester is more muted. So if you prefer the look of one versus the other that might be a deciding factor. The features of an outdoor pop up privacy tent can greatly affect its usability and function. We’ve listed a few of our favorites below for easy reference. In general though, you’ll want to get a tent that has the features you specifically need. And the more the merrier, as it allows for increased opportunities to break out your tent. Again, just make sure its got what you need and that the features are high quality and built to last. Now that you’re armed with the right information, it’s time to get down and dirty with some reviews. We’ve scoured the web, retail stores and more to collect what we’ve determined are the top 10 best pop up privacy tents. You’ll find they cover a wide range of cost and feature categories for every budget. If you’ve ever got any questions as to which is bet just reference the above buyers guide and summaries below. As our number one choice, the Green Elephant Pop Up Utilitent is simply put, the perfect privacy tent. Not only is it easy to use, but it’s made from ultra durable materials and purpose built for the great outdoors. From BBQing in an isolated campground to adventuring on the open road, the Green Elephant can do it all. Manufactured from heavy duty polyester fabric and a robust steel frame, the Green Elephant Pop Up Utilitent is built for years of outdoor use. Plus, the heavy duty zippers and thick double stitching, ensure ease of use and excellent durability. 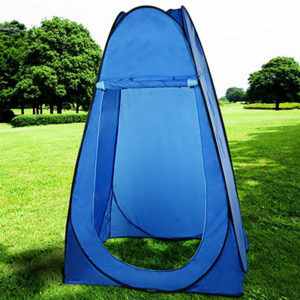 You’ll also find this pop up privacy tent has no issues holding its shape and is impossible to see through. It’s highly water repellent and excellent for any outdoor event with fully thermo-sealed seams. In summary, this has the best build quality on the market and is light years ahead of the many cheaper options. As you would expect, the Green Elephant Pop Up Privacy Tent takes only moments to unfold. 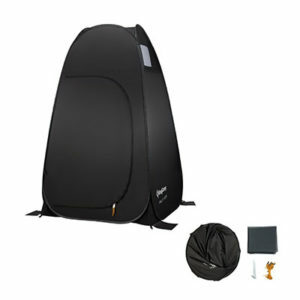 Once fully opened it has a massive 6′-10.7″ of headroom making it the tallest privacy tent on the market. That means no ducking or bending down is required and claustrophobia is a thing of the past. Take a look at the video below to get a better feel for its size and how it operates. The freestanding design is perfect for backyards and campgrounds. However, this unit also comes with guy lines, tent pegs and sand bags for windy conditions or uneven surfaces. It’s also got an open top for enhanced air circulation and natural light. Additionally, the no floor design is easy to keep clean and eliminates water puddles and debris. When you’re ready to head out, the Green Elephant Utilitent folds up into a 24″ by 1″ disk. This compact design makes it super easy to transport and it’ll fit in nearly any vehicle. Plus, at only 5.5 pounds it takes next to no effort to lift and maneuver into position. Overall, the Green Elephant Pop Up Utilitent is a high quality, feature packed privacy tent. It’s engineered to withstand rugged outdoor conditions yet still provides many of the comforts of home. If we had to choose a single pop up privacy tent to buy, we’d get this one every time. The Campla Portable Pop up Dressing/Changing Tent is a mid-tier option that has top notch features. From the clever rolling zippered door to the durable nylon fabric, this pop up tent is built to perform. Not only that, but at 5.5 pounds it’s ultra portable and perfect for nearly any occasion. Built with stain and UV resistant fabric, the Campla Privacy tent is quite cleverly engineered. Its steel frame offers superior structural stability and the wide 47″ base keeps it grounded in light breezes. If you’re planning on taking it camping, it comes with handy stakes and tie out points for enhanced wind protection. We were also impressed with the included removable floor. No only is it super easy to take in and out, it fits perfectly and is strong enough to resist ground punctures. You’ll also find the seams and stitching to be of the highest quality and are very unlikely to tear. Even the extra thick zippers are ruggedly built and work in even rainy or dusty conditions. Whether you plan to use this as a portable dressing tent or a campground toilet tent, it’s perfectly suited for the job. Weighing in at 4.4 pounds and packing down into a compact 24″ disk, it’s ultra portable and ready for the road. Plus, it’s got the aforementioned removable floor so you can keep your feet nice and clean in even outdoor environments. The zippered door and meshed roof vents provide excellent ventilation while also closing for privacy and water resistance. Inside the Campla Privacy Tent you’ll find a useful hanging wall storage bag to hold odds and ends while you’re in there. Furthermore, the door has a clever strap system to elevate it when not in use. This is great for easy entry and to eliminate any odors. Overall, the Campla Portable Pop Up Dressing Tent is well priced and excellent for the outdoors. The removable floor helps to differentiate it from the competition while the sturdy design and robust materials solidify it near the top of our list. If for some reason our number one pick is out of stock, this makes for a great alternative. The F&D Waterproof Pop Up Privacy Shelter is a lightweight unit that excels with its compact size and stable design. It boasts a fiberglass frame and UV blocking fabric for premium performance that make it a great buy. 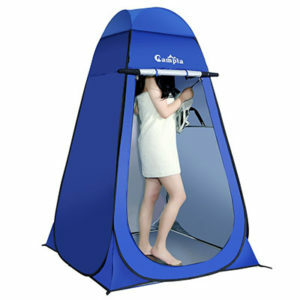 Even more, this privacy tent is available in five different colors to fit your personal style. With high quality zippers and durable double stitched seams, the F&D Waterproof Pop Up Privacy Shelter is built to last. Plus, it’s fully sealed and 100% water resistant so you won’t have to worry about getting wet in a storm. Even the door toggles are made from extra thick fabric and won’t mind a few drops in the dirt. The frame is made of lightweight yet flexible fiberglass and is built for superior performance. Additionally, it is much easier to fold down than a steel or aluminum option, yet is still extremely sturdy. You’ll also find the fabric is rated to SPF 50+ and can block the harshest sunlight with ease making it a perfect beach accessory. When folded, this pop up privacy shelter is only 22.6″ wide an a couple of inches tall. Being so compact it is easy to throw in the car for a weekend camping trip. Once deployed, the top unzips and allows the use of a portable shower so you can stay clean on the road. You’ll also find that it’s very roomy and the sides are far enough away you won’t constantly bump into them. The F&D Pop Up Shelter also works great as a portable camp toilet tent. It has a zippered door, window and top for excellent ventilation and enough room to place a portable toilet. We would have liked a place to store toilet paper or accessories like the Green Elephant Pop Up Utilitent, but it’s hardly a deal breaker. Overall, the F&D Waterproof Pop Up Privacy Shelter is a budget friendly, lightweight privacy tent. While it doesn’t quite have as many features as a few of our other choices, it’s a simple product that works. If you’re just looking for a little privacy and not much more, this’ll do the trick. With an ergonomic design and loads of features, the Sportneer Portable Pop Up Changing Tent is worth every penny. Inside, it’s got everything you need with a handy clothes line, storage bags and more. For camping, outdoor events or backyard functions, it’s hard to go wrong with the Sportneer. The Sportneer Pop Up Privacy Tent is made from outdoor rated nylon and built to withstand rain, wind and dust. You’ll also find the heat sealed seams and double stitching to be of the highest quality. Even the frame loops are reinforced so the steel supports won’t go flying out at a moments notice. Each of the tie out points are securely attached to the base and work great with the included ground stakes and guy lines. Additionally, the interior pocket and clothes lines are well built and can hold a sizable amount of gear. We were also please to note the zippers are quite large and durable making this an excellent outdoor product. Design wise the Sportneer Pop Up Privacy Shelter is similar to our other top choices. It features a large 47″ square base and offers nearly 75″ of headroom. This makes it big enough to fit a chair inside and you won’t be bumping your head. Plus, with the zippered door and window there is a ton of natural light and ventilation. This unit also features a no floor design. This is perfect for outdoor latrines and requires very minimal cleanup. Not only that, but it helps to reduce the overall weight to a paltry 4.9 pounds. When you consider the weight and the included carrying case, it makes for an extremely portable design. 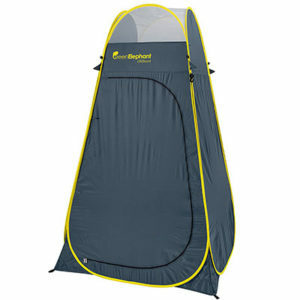 Overall, the Sportneer Portable Pop Up Changing Tent allows for easy and convenient privacy at a moments notice. It’s got all the pockets, vents and zippers you could ever want and uses durable, long lasting materials. If you’re in the market for well reviewed option, this definitely makes the cut. 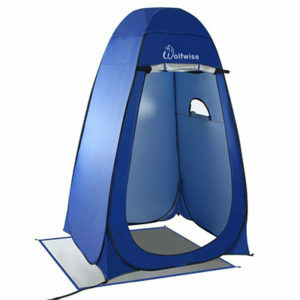 The WolfWise Instant Pop-Up Privacy Tent is custom designed for use as an outdoor changing room or bathroom. It’s got an extra large interior and plenty of headroom for a welcoming feel. However, If you want to use this with a portable shower, you might want to look elsewhere. With its top “T” door model costing a bit more than is usual, it’s safe to say you can expect a high quality product. The WolfWise Pop Up Privacy Tent features a scratch proof floor cover that is excellent at keeping your feet clean and your tent safe. You’ll also find that the sturdy nylon material is very resistant to the elements and perfect for blocking the sun’s harmful rays. Even more, the steel frame does a great job of keeping this tent up in even moderate winds. 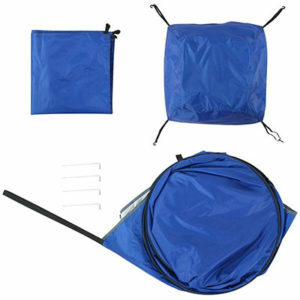 The zippered door is made from rugged nylon and will fully seal your pop up tent in case of a storm. Meanwhile, the ground tie outs are securely attached and can be used with the included stakes for undesirable weather conditions. In general, you can expect the WolfWise Privacy Tent to perform in the rain, snow or anything mother nature can throw at it. As you would expect, this pop up privacy tent opens in seconds and is a snap to set up. Assuming you’re not expecting any storms you won’t need to stake it down either. The large interior gives it a great open feeling and is a far cry from some of the smaller, lower cost options. Even though it’s large, it still weighs in at a modest 4.4 pounds making it extremely portable. Additionally, the unique “T” door design makes it much easier to enter and exit than more traditional roll up zippered doors. 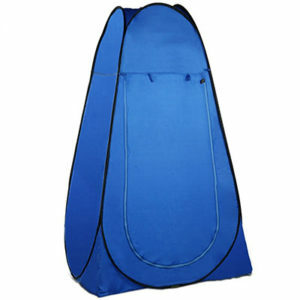 This pop up privacy tent also features a large zippered window which is great for extra ventilation. Although, we would have liked mosquito netting around the vent so no flying critters get in. The top includes a rain fly for a bit of added weather protection which is a definite nice to have feature. The only real gripe with this unit is that it’s quite tricky to fold back up. We’d suggest you give it a try at home before heading to the campground. In summary, the WolfWise Instand Pop-Up Privacy Shelter is a great pick with extra headroom and an over-sized design. If you’re worried about being too cramped or not having enough room, this is a perfect choice. While it is a bit more expensive that some of our other picks, it’ll perform great in all conditions and is built to last. 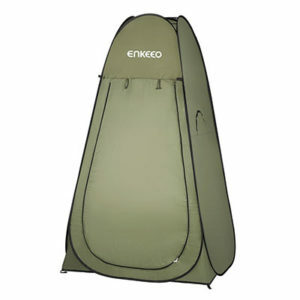 The Enkeeo Portable Privacy Tent sets itself apart by having dual zippered air vents for enhanced circulation. You’ll also find the integrated clothesline, storage bag and rain fly to be quite useful. This would make a great addition to any box of camping gear. With a similar design to many of our top choices, the Enkeeo Portable Pop Up Privacy Tent is very well built. It’s made from water and sun resistant nylon and features extra fabric and sealant on each seam to prevent leakage. The zippers are nice and thick with a satisfying feel to them. Both the door, ground pad and rain fly and purpose built as well. They are thick enough to resist all but the sharpest of rocks and are great at keeping the outdoors, out. Even after multiple uses you can expect this rather affordable privacy tent to keep on trucking. Many lower cost options tend to split apart at the seams after only a few expeditions. Design wise, the Enkeeo is a master at air ventilation. With a huge door, dual window vents and a top meshed roof it’s ideal for circulation fresh, clean air. However, if it starts to rain, you can quickly zip everything up and pop on the rain fly for a nice and dry shelter. Inside we were pleased to see it came with an included clothesline and storage bag. These are ideal for trips to the beach or campground where you’ll want to change clothes in private. Plus, the storage area gives you a place to put your phone and keys while you in there doing your business. No need to worry about them falling out or getting lost. 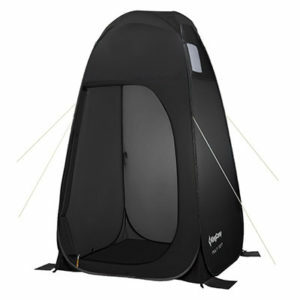 Overall, the Eneeko Portable Pop Up Privacy Tent is built for air circulation and makes a wonderful changing room. Whether you’re planning on taking a trip to the beach or the woods, it’ll make a great piece of kit and will lasts for years to come. Even better, it’s priced very reasonably and comes in an awesome woodland color! The Partysaving Portable Privacy Pop Up Room is designed specifically with changing clothes in mind. As such, it’s not quite a useful as some of other choices and is a bit lacking in ventilation, windows and features. This pop up privacy tent uses simple materials and a down to earth design. With only one zipper on the whole unit you’ll have less failure points and reduced seam stress. This mean a longer lasting product that can take a few hits. It’s also got double stitching throughout the unit and reliable seam sealing for a stronger feel. The frame is made from dura-light steel and is both lightweight and sturdy as the name suggests. You’ll find it has no trouble retaining its strength after multiple uses. Even more, the integrated clothesline is made from ultra thick elastic and security attached to the tent walls. While it may be simple, the Partysaver pop up privacy tent is undeniably effective. As a simple, no frills unit it does have a few design features that make it stand out. The main one is the dual layered fabric. This provides excellent privacy and lets absolutely nobody look in. You’ll also find the same reinforced seams and easy to open zippers as our other options. It’s got a fully open top, that while not rain proof, is perfect for taller folks. There isn’t any sense of being compressed and it’s got great natural light. We do think that the overall footprint is fairly small though. 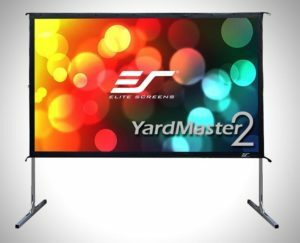 At only 40″ x 40″ it is one of the smallest unit’s we’ve reviewed. It also doesn’t come with a storage bag so you’ll have to keep phones and wallets in your pocket while in use. A nice elastic clothesline is attached to the interior wall though and does provide some extra versatility. Overall, the Partysaving Outdoor Portable Pop-Up Privacy Room is a very simple and cost effective unit. What it lack in features it more than makes up for with it’s robust build and ultra thick double fabric. If you just want maximum privacy, this’ll be your best choice. The KingCamp Portable Pop Up Privacy Shelter is specifically built for outdoor use. However, the material is a bit thin and it’s possible to see shadows and silhouettes. If you’re okay with this, it makes for a great, feature packed option. Overall this pop up privacy tent is made from sturdy, heavy duty nylon and is supported with a durable steel frame. You’ll find all the tie out points and seams are well reinforced and perfect for outdoor conditions. The included rain fly is high quality and in conjunction with the sealed seams, excellent for blocking rainy and wet conditions. We do want to mention that while sturdy, the material is a bit thin. This allows any outside observers to see vague shadows and silhouettes of anyone inside. While not a huge deal to us, if you’re a bit more private than we are it might be something to keep in mind. With that being said though, everything else is very well made and clearly up to snuff. The KingCamp Portable Pop Up Privacy Shelter is perfectly designed to use as a changing room, bathroom, beach shelter and more. It’s got an open top for extra ventilation and an open air feel. Plus, it’s great if you want to hang a portable shower on a tree branch. You’ll also find the removable floor very easy to use. There are four Velcro attachment points and it’s held securely in place. Size wise, this comes in as one of our larger models reviewed. It stands at over 6 feet tall and is very roomy inside. You should be able to fit one adult very comfortable or three small kids if the need arises. Also included are a storage pouch and handy zippered meshed window for a nice breeze. Overall, the KingCamp Portable Pop Up Privacy Shelter is perfect for people who don’t mind 90% privacy. If you’re dead set on being completely out of sight, go with any of the models higher up on this list. However, if you’re in the woods and just want a bit of protection, this makes for an excellent choice. The Boshen Portable Pop Up Privacy Tent is perfect for quick jaunts to the beach, but not exactly built for rough use. 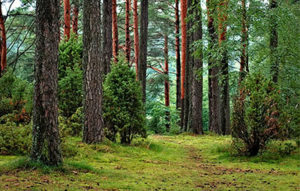 If you’re planning on going deep into the woods, you might want to select a more durable option. However, if you looking for a cheap, budget friendly privacy shelter this would make an good choice. In general we can say that the built quality of this unit is simply okay. Not great, just good. You’ll find that while it has durable fabric and all the right tie out points, everything is a bit cheaply made. The zippers tend to stick a little and it’s possible you’ll have issues getting them to open. Another thing that users tend to complain about are the seams coming apart after one or two uses. Keep in mind however that only a small portion of owners have these issues, most love the Boshen. It does have a robust door and great Velcro window that is not only secure, but also very easy to operate. The fabric is nice and heavy so you won’t have to worry about being spied on in the sunlight. Overall, this is a low priced tent and can’t be expected to survive more than a few years of heavy use. While the build quality might not be the best, the design is straightforward and to the point. It’s got a large zippered door which is perfect to get in and out of. You’ll also find an integrated storage pocket and clothesline for changing on the go. Two zippered vents line the roof and are great for a bit of extra air circulation in the outdoors. Similar to the other pop up privacy shelters, this unit is very easy to set up. You can expect to spend only a few seconds before it is ready to use. Taking it down is a bit more of a process and can take a few tries to master. We can promise you though, that this tent does go back in the carrying case. When folded it is a small 22 inches in diameter making it ideal for travelling and weighs only 4.8 pounds for easy transport. Overall, the Boshen Portable Pop Up Privacy Tent is a lower quality model for people on a budget. While it will do the job of hiding you in the wilds, it won’t last if you tend to go hard on your equipment. You’ll also find that it has a few more quality defects than some of our other top choices. 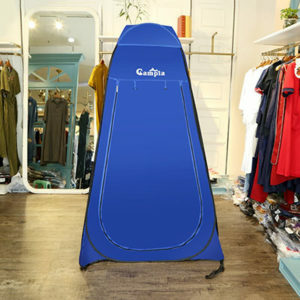 With gaudy colors and an ultra cheap price tag, the GigaTent Pop Up Pod Changing Room is last up on our list. While it might not be as high quality or have as many features as the others, it is by far the cheapest. On a shoestring budget? Get this guy. Frankly speaking, all of the other options on our list are built better than the GigaTent. The zippers are a bit frail and tend to bend or stick over time. You’ll also find the stitching and fabric to be weaker than expected. This leads to early seam separation and reduces the outdoor longevity of the unit. Both the anchor tie out points and the sewn in sandbags are passable however. If there is a heavy wind you can be fairly certain this tent will survive to see another day. However, if you’re expecting days of winds and rain, you might want to go find some cover elsewhere. The GigaTent Pop Up Privacy Tent is a bare bones offering that doesn’t add anything extra. It does a good job of granting you some privacy if you’re changing clothes, but not much else. You’ll find that it has a fully enclosed roof that block line of sight, but it also prevents air circulation. Overall the GigaTent Pop Up Privacy Shelter is a super low cost, low quality unit for folks on a budget. While it does serve its function, it won’t last long or work well. If you have to get this one it’ll work, but otherwise we’d recommend one of our top 3 options instead.